FAYETTEVILLE – Arkansas had a cold start to the second half and Mississippi State used a 23-1 run to get a 77-67 win at Bud Walton Arena Saturday night. Arkansas scored the first two points of the second half on two free throws by Daniel Gafford, but the Razorbacks would ultimately miss its first 14 shots from the field. Mississippi State went from down eight to up 14 midway through the second half. However, Mason Jones, who tied a career-high with 30 points, kept Arkansas within striking distance. 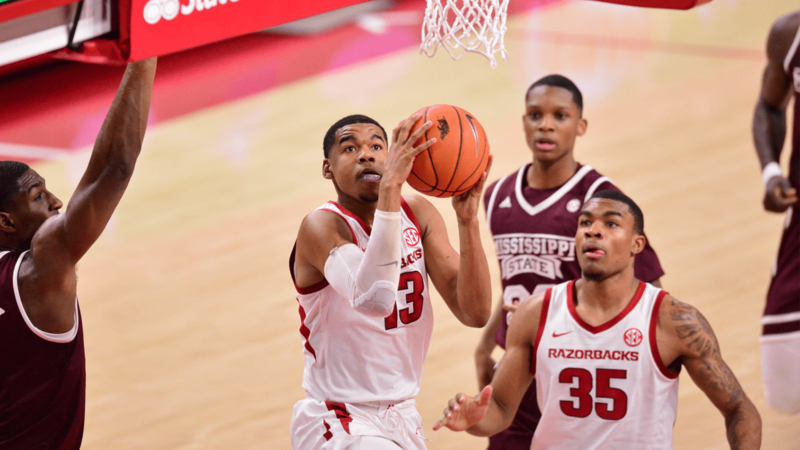 The Bulldogs never folded andQuinndary Weatherspoon thwarted Arkansas’ final push with a 3-pointer from the top of the key to put his Bulldogs up 12 with three minutes to play. Weatherspoon finished with 22 and was joined in double figures by Tyson Carter (18), Reggie Perry (12) and Robert Woodard II (10). Arkansas will travel to Auburn to face the Tigers next Wednesday (Feb. 20). Tip-off is set for 7:30 pm on the SEC Network. Arkansas made its first five field goals, including three 3’s, but had seven turnovers in the first eight minutes. Arkansas only made three turnovers the rest of the half. The Razorbacks would shoot 58.3 percent in the first half, including 60 percent from 3-point range (6-of-10). There were four ties and four lead changes and Arkansas held the largest lead of the half, six points, twice – once at 14:12 and the halftime score. Jalen Harris hit a turn-around jumper with six seconds left in the half, marking the third time Harris has made a basket in the final seconds of the first half this season. He also made a long 3-pointer at the buzzer sounded at Texas Tech as well as fast-break layup with three seconds left in the Georgia win. Mason Jones led the Razorbacks in the first half with 12 points, making 4-of-6 from 3-point range. SECOND HALF: Arkansas Shot 28.6 percent from the field. Arkansas scored the first two points of the second half, but Mississippi State went on a 7-0 run to get to within one, 40-39. Mason Jones made a free throw to end the drought. However, the Bulldogs kept the momentum and went on a 23-1 run overall to take a 14-point lead (55-41) at 12:01. Arkansas missed its first 14 shots of the second half until Mason Jones made a layup and converted an old-fashion, 3-point play. Mason Jones went a 6-0 run of his own to cut the deficit to 10, 61-51, with 7:20 left. Arkansas was down nine, 66-57, after a Jalen Harris jumper with 3:16 left before Quinndary Weatherspoon made a clutch 3-pointer and the Razorbacks never recovered. Arkansas’ starters were Isaiah Joe (G) – Jalen Harris (G) – Mason Jones (G) – Adrio Bailey (F) – Daniel Gafford (F). This has been Arkansas’ starting lineup in 23 of its 25 games. Mississippi State got the first possession. Mason Jones scored the first points of the game, a 3-pointer at 19:35. This was the 62nd all-time meeting between Arkansas and Mississippi State. The Razorbacks own a 33-29 advantage in the all-time series, including a 28-25 mark since the Razorbacks joined the SEC in 1992. Arkansas is 21-7 versus the Bulldogs in Fayetteville. Mason Jones tied his career high with 30 points. It is the fourth time a Razorback has scored 30-plus points. Isaiah Joe had 34 versus FIU, Jones scored 30 versus Florida and Daniel Gafford scored 32 versus LSU. Gafford was held to just eight points but he grabbed 11 rebounds, marking the 11th time he has pulled down double-digit rebounds this season. For more­­ information on Arkansas Men’s Basketball, follow @RazorbackMBB on Twitter.